ps. this photo.. AGAIN not in auto. i'm pretty proud of myself. ya. 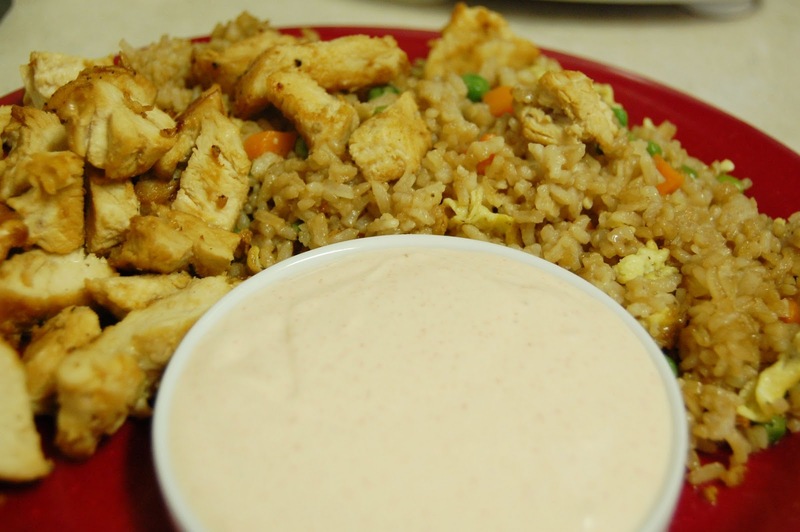 i'm gonna pat myself on the back..
fried rice & white sauce or shrimp sauce. i've had this white sauce recipe printed out for few weeks now.. it just seemed like it wasn't going to happen. first i forgot the paprika. then i got that & we were out of sugar. then we had sugar, but needed mayo. so annoying. proof of exactly why i need a grocery list to shop. i guess age + 2 kids does that to you! there are MANY variations out there... i'm guessing that's probably because no restaurant willingly hands out their own recipe, so everyone comes up with a concoction of their own & puts it on the web. i went with this one & doubled it. i liked it as is. the hubs added a little more sugar & ginger to his. either way, it's soo close to what we've had here locally & good enough for us. & the fried rice. easy peasy. i read a bunch of how-to's online & then just nixed them all & went for it. 1. add a little oil to the pan. whisk eggs, garlic powder, salt & pepper. add eggs to pan & scramble. remove eggs from pan. 2. add more oil to the pan. add the rice. stir to break up the clumps. 3. once the rice is warmed through, add peas & carrots (as much as you like) & soy sauce to taste. the hubs says now that i conquered the white sauce sushi is next. Yum- love fried rice! Can't say I've tried the white sauce before though. May have to try it. Thanks for linking up to my Catch a Glimpse party! Thanks again for the Spanish Pork chops! I lost my original recipe but yours is very close to mine. I lived in Tampa FL and a lot of Hispanics shared some great food!